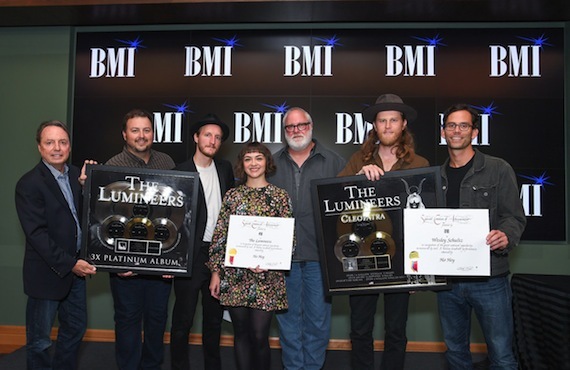 It was Lumineers Day in Nashville on Thursday (Sept. 14) as the group’s successes were touted by Dualtone at a special celebration at BMI. 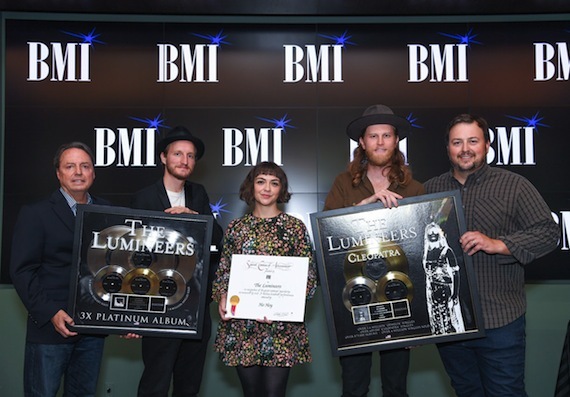 The group was presented with plaques during the event honoring the successes of their triple-Platinum self-titled debut album and certified Gold follow-up album Cleopatra. Their three platinum singles – “Ho Hey,” “Stubborn Love,” and “Ophelia” – and two gold singles – “Flowers in Your Hair” and “Cleopatra” – were also recognized by BMI’s Vice President of Writer Publisher Relations, Jody Williams, who presented the group with MillionAir awards in recognition of 3 million radio performances. The special ceremony concluded with a surprise from Williams: a proclamation declaring September 14, 2017 “The Lumineers Day” in Nashville signed by Mayor Megan Barry.